How To Extend The Life Of Your Carpets? Carpets look good only if they are new or maintained properly. Unfitting handling can bring about the need for a replacement. 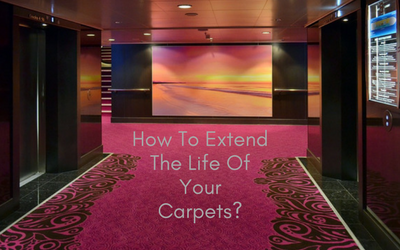 Here are some expert tips on how to extend the life of your carpet. Having a clean carpet is very important. A dirty one makes a safe haven for thousands of dust mites, and pounds of soil can accumulate underneath it. Dirt causes grates against the yarn which forms scratches on the fibers, which in turn take away the luster. It is a good idea to avert usage of shoes on the carpet, thereby extending the lifespan and decreasing the need of vacuum cleaning. If this is not possible at all, at least try to keep the adjoining areas clean or lay a heavy-duty doormat at the entrance. Vacuuming the carpet on a regular basis is a great way to extend the lifespan. The process diminishes the accumulation of dirt that causes harm to carpet fibers. Vacuuming is necessary especially in areas of high traffic. Make sure that you use a good vacuum cleaner that is efficient in sucking away the soil build up. Stopping accidental spills is next to impossible. But you can definitely spot and clean them. Take immediate action and act as soon as possible. Sop up any excess liquid. If you don’t act immediately, spills can soak into the carpet and encourage mould growths. Furthermore, if the spill contains acid, it may start to eat away the fibers. Whatever you try, carpet cleaning is not all a DIY job. To ensure long lasting cleanliness, hire carpet cleaning services in Brookvale every one or two years. Remember, maintenance is not the key point, but proper and professional maintenance is all that works. The professional can provide you with expert cleaning methods that is impossible to acquire in DIY projects. Even if you have the same equipment and solutions, you cannot achieve that quality cleaning. Sticking to a fixed furniture arrangement can wear your carpet, especially to those areas where they are placed. To prevent this, you can move and rearrange the furniture to avert trails following damage. Changing the path of traffic course spreads the load on the carpet evenly and this ensures longevity too. You care for the carpets and they care for you, which means saving further investment in buying a new carpet, decorative presentation and not to mention, the durability. Keep visiting our blog space for interesting posts on commercial cleaning solutions.